Tecno Company keeps Launching its Android Smartphone every 2weeks. But has a matter of fact, The Company has just launched a new awesome and Super fast with dual cameras smartphone today called Phantom 8. When it comes to specifications, The New Tecno Phantom 8 is a dual Nano-Sim and it runs on Hios) Android 7.0 nougat. The smartphone Feature 5.7-inch display with a screen resolution of 1920x1080 and is powered by 2.6Ghz Octar-Core processor with 6GB Ram and 64GB of internal storage which can be expanded via 2TB SD card if you want more space. As for the cameras, The New Tecno phantom 8 sports 12 & 13megapixels Dual cameras with 10x Super zoom at the back while it also sports a 20megapixels with bright selfie at the front. The smartphone comes with 3500mah non removable battery with fast charging support and its connectivity includes 4GLTE, Wi-Fi, Bluetooth GPS, USB OTG. 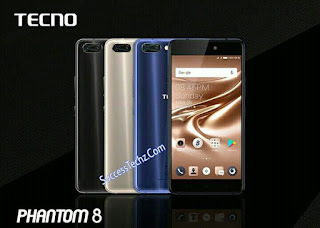 Tecno Phantom 8 is fully packed with accessories. Here is a list of some of the accessories inside the boxes.